Source: Life Inc. – Role reversal: Employers say they cant find workers. 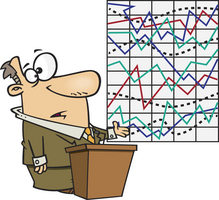 “Employers are getting pickier and pickier,” Holmes said. “We want the perfect person to walk through the door.”Other experts also are seeing evidence that employers just aren’t working as hard to recruit workers, either because they can’t afford to or they don’t feel like they have to. Employers may not be looking far afield because they cant afford moving expenses. Employees may be less willing to move because of the housing bust. I guess I am just showing my age here but at the beginning of my working years it seemed like employers hired and then trained their workers to match the job. Now days they seem to expect you to come on-board fully loaded and ready to fire. Certainly there are many jobs that require an extensive education. Nuclear physics and fields like that come to mind in this area. But many jobs can be learned with just a few weeks or maybe months of training. Why aren’t employers willing to hire and then train their workers anymore? I think one answer to that is the idea of loyalty. They don’t think they will stick around after being trained. When I started working as an engineer for a “large communications company” in 1970 the workforce I entered contained many loyal workers. They knew that if they did their job their employer would take care of them and their families. Most expected to work their entire life for the company because they knew their employer cared for them. Loyalty is just not part of the job description any more in the U.S. We all see it everyday when we encounter “people behind the counter” of most businesses. Most really don’t care whether you like their product or service; they just want to get through the day and get their paycheck. If another job comes up that pays a little more they will quickly dump the job they have for it. Fortunately there are exceptions to this general trend. I try to go out of my way to praise someone who goes the extra mile for me. They need all the encouragement that can get it today’s world. Can we ever get back to company/employee loyalty? Probably not to the extent that it was in my early working years but I think that if employers dumped a few of their MBAs and started treating their employees as assets again things might just change. There are a few companies out there that do that but they seem to be far and few between. Some probably think that the phrase “More with Less” is a recent invention but I was brutally hit with it in the 1990s. As my team around me was constantly shrinking the workload was constantly increasing. The above term was almost nauseous to me during that time. I wish I could have come up with some of the things in the Dilbert cartoon at the time. The last couple of years of my corporate life were not pleasant. I was working sixty hour weeks to do “more with less” (less meaning I was never paid for the extra hours!). 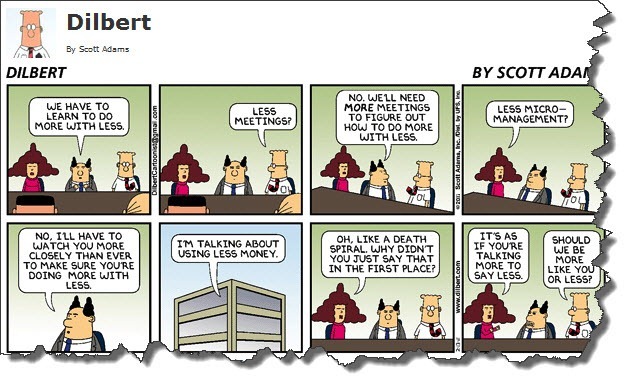 No there never were less meetings or micro-management; I got plenty extra of that. I left the corporate world almost eleven years ago but I am pretty sure pretty much the same thing is happening today. This goes back to a previous post about the three legged corporate stool. See it at http://whatwouldwillsay.wordpress.com/2011/01/13/about-the-bailout/ The employee leg of the stool was constantly being shortened and it hasn’t stopped even now. 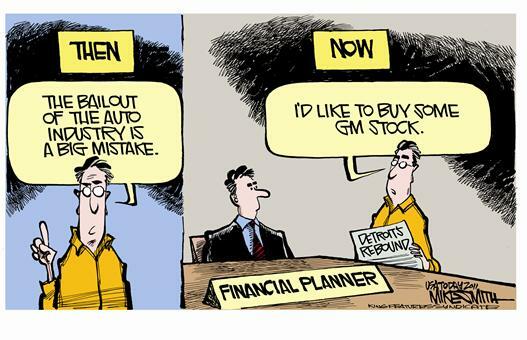 A little over a year ago the Republicans were screaming about the bailout of the auto industry. The Republicans scream about almost everything so I guess that is no biggie. But it is ironic that less then two years later they are filling their portfolios with the very stock they rallied against. Anyway that stool has become so unstable that even a fly could not perch on it for long. And remember flies can hang from a ceiling for hours at a time. (I know I watched one do that!) The first leg to be shortened was the customer one. Many U.S. companies thought that we were somehow idiots and they could sell us about anything they chose to make. The Employee leg basically got ripped entirely off the stool when companies decided that their workers were liabilities instead of assets. I can remember that happening personally to me about 1985 or so. (Oops, that the Reagan years again). So now all we have is the round seat of the tool being blown about with one long leg. So you know what happened? Company started swirling around the drain.OK now that I have laid the foundation for this story let’s get back to the bailout. When the government bailed out the auto companies they pretty much insisted that they start making products what were good for the customers and good for the country. I.E. no more gas guzzling Hummers! I suspect the most disgruntled groups around now are the marketers. They were pretty much give the door I guess. But I think I know where they landed. They are in the home improvement business now with the mantra “If your kitchen doesn’t have granite counter-tops, cherry cabinets and stainless steel appliance then you are totally unable to cook a delicious meal.